I wrote the original version of this song in 1996, after a conversation with a friend. Over the years I made revisions to the lyrics and eventually changed the melody, but the message behind the song remained the same. Many years prior to writing this song, I had read a book in which the author used the phrase, ‘the misty flats.’ I remember nothing else about the book, but I sure have visited some misty flats. I hate to admit it, but I’ve spent far too much of my journey in that very place. In spite of the fact that I know my way out, and could be walking beside still waters, or strolling through green pastures, perhaps even standing on a mountain top, I end up wandering aimlessly, wondering why the joy has gone from my life. I get preoccupied with just living day to day, and I wander off the trail, neglecting my Bible and forgetting to pray. I get so far away from the Lord that I convince myself that I’m going through a valley, when in reality I’m really just flopping around in a muddy ditch. I may feel like my circumstances are dire, but it’s my frame of mind that’s in need of an adjustment. I’m looking at things from my own earthly perspective rather than setting my eyes on things above. It’s my own sin; my pride, my selfish attitude, and my laziness that has put a black cloud over my head, and blocked my view of the Lord. When I stay on the right path, I may encounter real valleys and storms, but I know that if I just keep heading straight, my Lord will bring me through. It’s when I try to side step, that I find myself back on the flats, and I know that one more misstep could take me into the mud and the mire of the slough. Thankfully, my Lord, is gracious and long suffering, and I’m only one prayer away from getting my heart right. Somehow, he nudges me back to the path he’s set out for me, and I step out into the warmth of his light. As I thank him yet again for his mercy and grace, I wonder how I ever settled for the misty flats. Created by my sin and doubts. Then you lift me to the heights upon your wings of love. From that lofty mountain to cloudy misty flats. I know you would guide me along the higher way. You remind me each time I slide and I lose sight of you. Lord, forgive my sin; I surrender all to you. Psalm 94:18 When I said, My foot slippeth; thy mercy, O Lord, held me up. *Edited- I did some research and found the book I read many years ago. It is called, By Searching, by Isobel Miller Kuhn. "At the end of my walk home, I came to the conclusion that I would henceforth accept no theories of life which I had not proved personally. And, quite ignorant of where that attitude would lead me, I had stepped off the High Way where man walks with his face lifted Godward and the pure, piney scents of the heights call him upward, on to the Misty Flats (original). The in-between level place of easy-going-nothing very good attempted, yet nothing bad either- where men walk in the mist, telling each other that no one can see these things clearly. The Misty Flats where sheep would graze the in-betweeners drift to and fro- life has no end ut amusement and no purpose- where the herd drift with the strongest pull and there is no reason for opposing anything. Therefore they had a kind of peace and mutual link which they call tolerance." My research also led me to a poem by John Oxenham, called The Ways. It's clear that Isobel Kuhn was quoting from this poem. A High Way and a Low. I love the ditch analogy! We are so used to thinking of mountains and valleys, but a valley is a nice place to live. Ditches better describe how we've fallen into muddy bogs, leaving ourselves to wallow. Thanks, too, for stopping by. It was a couple of other 'Alabaster Box' posts that sent me researching who used it and when in the Bible. 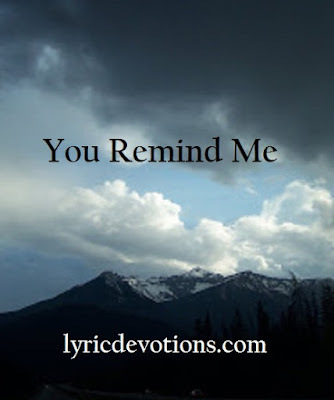 The verses, as well as Cece Winan's lyrics, speak to us of His love and ours in return.